NSTI version 2.0 has officially been released. After a lot of hard work, and many feature-rich additions, the Nagios SNMP Trap Interface has been overhauled to include some major performance increases and greater ease-of-use. The User Interface has been reimagined and streamlined to make exploring and managing SNMP traps much easier. The functionality of NSTI 2.0 is not hidden within various menus, but exposed on the main GUI to reveal the capabilities of NSTI. This allows you to parse through streams of SNMP traps more quickly and efficiently. While creating a more straight-forward version of NSTI, advanced functionality was not forgotten. NSTI 2.0 provides users with a dedicated screen for each trap that presents all of the data that has been captured from that trap. 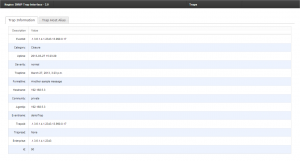 This allows for the advanced trap information to be accessed easily without cluttering the main NSTI page. Improvements have also been made to NSTI’s ability to integrate with existing Nagios XI implementations. Integration with Nagios XI makes it easier for system admins to manage and stay on top of SNMP trap information. NSTI now has the ability to write SNMP trap information directly to the Nagios XI server. This allows checks to be made for unread SNMP traps, and for admins to be alerted to traps based on their status (Critical, Warning, Unknown). Previous SNMP trap management within Nagios XI only showed the last trap that was received, but now NSTI allows you to view all old traps and let the Nagios server know which ones have yet to be read. 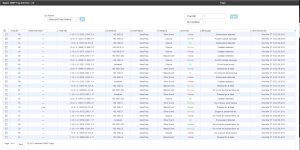 This assists the user in keeping track of all historical SNMP trap data. Another major improvement made to NSTI is its ability to force hostname information and sync it with the Nagios XI server. This allows admins to easily correlate SNMP trap information with the corresponding host on the network, and eliminating tedious sorting of traps and crucial information falling through the cracks. 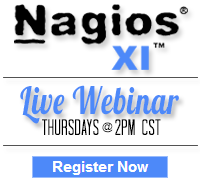 Please contact nscott@nagios.com for any questions. Category: Development and Nagios XI. 10 Comments Tags: nagios xi, NSTI, SNMP, SNMP Traps, trap management. This looks great! I have a dozen uses for this with our NagiosXI install. I assume this will either be integrated into or be installable into NagiosXI. Right now the release state is TBD, but feel free to play around with the beta! This looks great- where is the Beta version found? Bailing out of installation. Did not complete successfully. Could not install all Python dependencies. Please install problematic dependencies manually. Finally got it installing but…. Now this is not launching properly. Starting NSTI/usr/lib/python2.6/site-packages/django/core/management/__init__.py:409: DeprecationWarning: The ‘setup_environ’ function is deprecated, you likely need to update your ‘manage.py’; please see the Django 1.4 release notes (https://docs.djangoproject.com/en/dev/releases/1.4/). What are the requirements (Django release, python minimum release….) to get it working? i also got the same problems like Quentin. I still can not get it working. Any help would good !